DEAD LABEL CHALLENGE BLOODSTOCK TO A RECORD BREAKING ‘WALL OF CHAOS’!!!! Ireland’s fast-rising contemporary metal outfit, DEAD LABEL have drawn a line in the sand and challenged the punters at this year’s Bloodstock Festival to one of the biggest crowd interaction challenges in the Sophie Lancaster Tent on Saturday, August 11th. Are you up for the challenge? 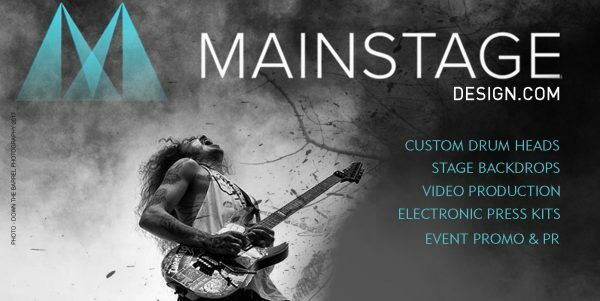 In case you’ve been living under a rock, Bloodstock Festival – the best metal party of the year – opens its gates NEXT WEEK on Thursday, August 9th, for what will be a jam-packed four days of non-stop metal across four stages from over 100 bands. Among this year’s incredible lineup, Ireland’s Dead Label will be gracing the Sophie Lancaster Stage on Saturday, August 11th, and have set a RECORD BREAKING challenge for the BIGGEST WALL OF CHAOS that has ever been attempted on this particular stage. The band recently started working directly with Thrashville (Dave Mustaine, Megadeth, his son Justice Mustaine and Danny Novell) who are currently consulting the band on their new album which should be released in 2019. Thrashville was started in 2016 when MEGADETH mainman Dave Mustaine and his son Justis Mustaine met CTK Management founder Danny Nozell, and they commenced managing VIMIC (featuring former SLIPKNOT drummer Joey Jordison) in 2017. A slew of Summer shows followed with appearances at festivals such as, Bloodstock (UK), main stage billing Metal Days (Slovenia), Made of Metal and Aggressive Music Festival (Czech Republic) and Gothoom Open Air (Slovakia), eventually leading to the band’s ‘Hot New Band’ feature in Metal Hammer (December, 2016 issue) and their critically acclaimed slot at 2017’s UK Download Festival. Having already performed at this years Hammerfest UK back in March, Dead Label are currently working on the follow-up to ‘Throne Of Bones’ and will be performing at this year’s Bloodstock Open Air Festival (August) in the UK on Saturday, August 11. Tickets for Bloodstock Open Air Festival are on sale NOW, make sure you get your’s today. Click this link for instant tickets. Click on the link below and join Dead Label for their return to Bloodstock Festival. 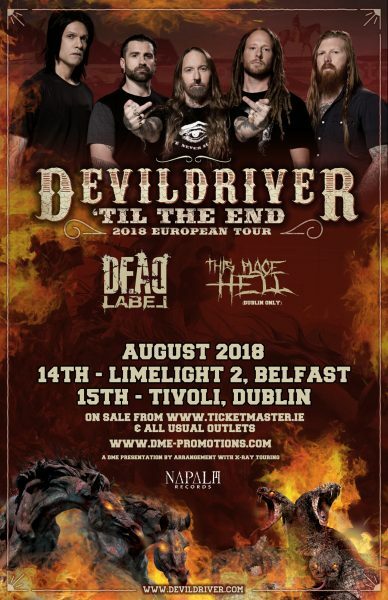 Dead Label will be joining DevilDriver for both Irish dates appearing at Belfast on August 14th and Dublin, August 15th. Tickets are on sale NOW via Ticketmaster. Please check out DME Promotions for further details.